V.S. RAMACHANDRAN, M.D., PH.D.,is Director of the Center for Brain and Cognition and professor with the Psychology Department and the Neurosciences Program at the University of California, San Diego, and Adjunct Professor of Biology at the Salk Institute. Ramachandran trained as a Physician and obtained an MD from Stanley Medical College and subsequently a PhD from Trinity College at the University of Cambridge, where he was elected a senior Rouse Ball Scholar. 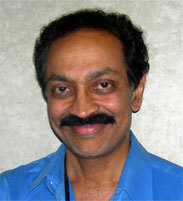 Ramachandran's early research was on visual perception but he is best known for his work in Neurology. He has received many honours and awards including a fellowship from All Souls College, Oxford, an honorary doctorate from Connecticut College, a Gold medal from the Australian National University, the Ariens Kappers Medal from the Royal Nederlands Academy of Sciences, for landmark contributions in neuroscience and the presidential lecture award from the American Academy of Neurology. He is also a fellow of the Neurosciences Institute in La Jolla and a fellow of the Institute for Advanced Studies in Behavioral Sciences at Stanford. He was invited by the BBC to give the Reith lectures for 2003 ; and is the first physician/experimental psychologist to be given this honor since the series was begun by Bertrand Russel in 1949. Ramachandran is a trustee for the San Diego museum of art and has lectured widely on art, visual perception and the brain. Ramachandran has published over 120 papers in scientific journals (including three invited review articles in the Scientific American), is Editor-in-chief of the Encyclopedia of Human Behaviour coauthor (with Sandra Blakesleee) of Phantoms in the Brain that has been translated into eight languages and formed the basis for a two part series on Channel Four TV UK and a 1 hr PBS special in USA. His work is featured frequently in the major news media including BBC, and PBS and Newsweek magazine recently named him a member of "The Century Club", one of the "hundred most prominent people to watch in the next century." He gave the BBC Reith Lectures 2003 on "The Emerging Mind", which have been published in book form as A Brief Tour of Human Consciousness : From Impostor Poodles to Purple Numbers.